Every year in rock seems to have a song that defines it historically. Mostly these are huge hits, actually they almost exclusively are, as it won’t be until probably 1988 that we get to a year in which N.W.A released the songs that had the biggest impact in rock ‘n’ roll without actually making any charts. But it’s not JUST the size of the hit at the time that leaves the biggest dent in the musical consciousness. After all in 1948 in rock that would go to Sonny Thompson’s endlessly charting Long Gone, a song certainly among the defining songs of the year, but not THE one that defined it. That honor would go to Wynonie Harris whose cover of Good Rockin’ Tonight did more to shape the musical terrain not just in that year, but also going forward. Of course that was a #1 hit in its own right, the first rock record to do so, which gave notice that this music had plenty of commercial power, but its impact went far beyond its chart placement as the record solidified the rock narrative and put in place many of the key attributes the music became known for. Throw in the manner in which Harris laid down the still largely in effect prototype for the rock frontman role in the process and its stature as the defining rock song for 1948 was never really in question. Well, at the risk of jumping the gun and making the ensuing eleven and a half months of reviews to come on Spontaneous Lunacy either irrelevant or at least massively anti-climatic, welcome to the defining rock song of 1949, courtesy of Big Jay McNeely. Nineteen Forty-Eight had been the Year Of The Rock Instrumental. Not only did these records dominate the roll call of major rock hits but in fact it was the most ubiquitous sound in all of black music, regardless of genre. With their collective assent into the charts rock ‘n’ roll became fully integrated into the tastes of the black community, their moaning, squealing, honking saxophones pouring out of jukeboxes and clubs everywhere you looked. So it’d seem odd then that with the sax-based rock instrumental already firmly established, with three #1 hits to their credit since early summer alone running the stylistic gamut from deep sultry grooves to storming barn-burners, that we’d be so quick to name another record from that same constituency as the song that would define the following year as well. Maybe you could rightly call it the after hours capper to 1948’s instrumental mania, but surely not the record that will claim credit as 1949’s banner waver. This is even more improbable considering that we just looked at another sax instrumental – on the same label no less – The Hucklebuck, which came out at the same time and would wind up being by far the biggest hit of the year, not only in black music but also with lots of impact in white America as well, with many established artists even adding lyrics to it just to jump aboard the train. So how could a record that wasn’t as big in the same general motif wind up rendering the rest of 1949 still to come little more than a prolonged aftermath? The answer is: It’s all in the way it sounds. Big Jay McNeely, as covered already with his debut from December, Wild Wig, was the first rock saxophonist who was never anything BUT a rocker. That in of itself makes a huge difference in his musical approach. This was no seasoned veteran making the uneasy transition to a potentially more commercial style at the behest of his record company, his manager, his wife or his bookie in hopes of pulling in more coin, McNeely was a legitimate true believer from the start. Though a fan of jazz McNeely was too young to have been completely shaped by its sensibilities. He’d never tried securing gigs as a jazz act, he had his first public performance at Johnny Otis’s Barrelhouse Club, a first of its kind establishment in that it catered to this new rock sound exclusively. His performances there were unhinged in their intensity and Otis was so impressed he had this kid join his own band, an amazing promotion of sorts for someone who just weeks before had been on stage in the club’s amateur night competition. With Otis’s band he played the most prominent featured roles on some records we met last month, Barrelhouse Stomp and Happy New Year Baby, and his star was on the rise. When Ralph Bass came into the club, either scouting talent or just to dig the scene, McNeely’s showmanship worked wonders on the hip West Coast A&R man/producer for New Jersey’s Savoy Records and he immediately signed him to the label. Perhaps for the first time with such a prominent black label it wasn’t jazz acts they were looking for now, it was what McNeely was already playing every night. If 1948’s sax instrumentals had been the sound of jazz cats slumming in rock ‘n’ roll, McNeely was something different. A rock act with absolutely no reservations about BEING a rock artist who therefore had no inhibitions, no guilt about blowing up a storm. He’d seen the reactions already at The Barrelhouse, he felt the room shake when everybody was dancing in rhythm to what he was laying down and he was determined to bring that same feeling to a piece of sterile wax. 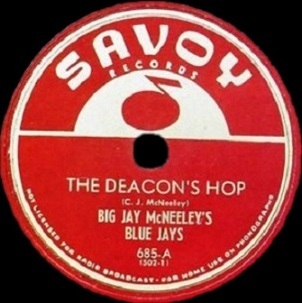 However with one recording session under his belt McNeely was faced with an unexpected obstacle at the session for The Deacon’s Hop when his older brother Bob, who’d first given Jay his old saxophone when Bob went off to war, then who backed his younger brother on baritone for his initial solo studio date, decided he didn’t want to be in the shadow of his younger sibling and quit the band. For all of the historical importance Big Jay McNeely can claim, and that’s plenty, Bob McNeely’s supporting role over the years can’t be underestimated. The two of them had an uncanny sense of interplay and it was Bob who not only held down the bottom with the same fervent attitude that allowed Jay to riff over the top of him, but who also contributed mightily to the sense of pandemonium with his own guttural honks and subterranean blasts. Though they’d reconcile very quickly and Bob would rejoin his brother and they’d remain together for years it’s almost cruelly ironic that on McNeely’s signature hit Bob is nowhere to be found, his place taken by a trombone of all things which played by Britt Woodman who was instructed to replicate Bob’s low notes as best he could. Maybe knowing the effect wouldn’t be as authentic more responsibility fell on Big Jay’s shoulders to carry the load and in that sense he didn’t disappoint. The record kicks off with a very distinctive rim shot/cymbal combination that sounds like a ticking bomb about to go off, an entirely appropriate intro to the explosion which follows. But Jay himself starts off fairly subdued, lurking rather than assaulting the senses as handclaps take on the backbeat, almost as if they were offering a warning for when Jay suddenly ramps it up, honking and squealing in a staccato progression which hits you like piston-like jabs to the face. When he draws his notes out at the end the other horns come in, the trombone playing a droning passage which acts as the underpinning, or an air raid siren – take your pick. By the bridge you almost swear that Bob McNeely heard the commotion, grabbed his baritone horn and climbed through a window to join in, so effectively does the unorthodox replacement mimic the sound. What gives The Deacon’s Hop its appeal is McNeely’s perfect distillation of virtually everything that previous sax instrumentals (in all of their stylistic diversity) had featured, wrapped in one surprisingly coherent package. We’ve focused on the primary dueling attributes before – the slow grinding riff and the manic extremes. Prior to this they’ve been mutually exclusive for the most part. The Sonny Thompson led sides, Earl Bostic’s Temptation and Paul Williams’s latest side were the headliners of the former while Hal Singer’s Cornbread, Wild Bill Moore’s We’re Gonna Rock and Bostic’s 845 Stomp were the flag bearers for the latter. Though utilizing the same instruments the two approaches had seemed incompatible with one another in the context of the same song. You may start with the slower riffs and build to a frantic climax, but that was about the only way the two had shared space on the same record. When Bostic tried to show off the two disparate ideas (well, more than that even) on Disc Jockey’s Nightmare just last month it came off as schizophrenic and disorganized, robbing the song of any semblance of structure and sensibility. But McNeely manages a rare balancing act here, first by giving the supporting horns the role of the riff, which itself is not too unusual, but then by alternating the melodic pattern so they only come in at specified times after he’s blown his lungs out. They alternate in such a way that builds tremendous anticipation, not JUST for the squeal-fest that awaits you the next time Big Jay takes the spotlight, but even while he’s ripping the loudspeakers to shreds you’re just as anxious to hear that grinding refrain the others lay down come back for an encore. That push/pull dynamic never ceases throughout this and because the two sounds are seamlessly switched off you don’t get the sense of it being two different records as might otherwise be the case. Instead it has a very organic, natural feel to it. Like a boat on rough waters once your sea legs are under you it just becomes second nature to roll with the tide. McNeely pilots the craft through storms of his own making and runs perilously close to some reefs, not to mention letting the others steer it to shallow waters and nearly run aground, but they maintain their course and drop you safely back in the harbor when it’s all said and done. 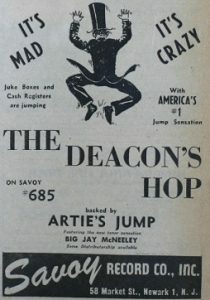 There were more explosive displays on the horn shown prior to this by other sax players, not to mention Big Jay himself, and there would be even more wild antics to come from him, but The Deacon’s Hop has a sense of pulling everything together and leaving you with an instantly identifiable song, something even many of the best instrumentals failed to do. Even the title itself seems to convey a sense of higher purpose in the name of rock ‘n’ roll. A voluntary corruption of the divine – much in the same manner of Roy Brown’s Good Rocking Tonight – where the spiritual release that once was found only in the sacred music of the church was being appropriated for the earthly pleasures of the flesh. Drinking, dancing and screwing were now almost being offered up as reason for worship with McNeely’s stirring up the masses like a shepherd leading his wayward flock. At the dawn of 1949 the sax instrumental was a hot trend, but to outsiders that may have been all it was, unsure as to its ultimate destination. When Williams scored with The Hucklebuck at this same time, crossing into the mainstream pop realm, there was a very real chance its enormous success would almost invalidate that which preceded it and had been more squarely entrenched in the rock field. Who was to say that the sax might not start aiming for the same mainstream goal from now on, leaving the rowdier rock styles behind in the process? But McNeely ensured that wouldn’t happen, not only with this record which would never be acceptable in pop circles for its crudity, but also with the accompanying hysteria his live performances engendered which gave the music its unsavory reputation and outlaw image that branded it as undesirable to begin with. This was nothing like you found anywhere else in popular music at the time. McNeely pranced through the aisles amongst the throngs of screaming fans and laid on his back on stage with his feet in the air blowing to the heavens. When he dropped to his knees as if worshiping a righteously down and dirty rhythmic god it caused a generation of followers to find something akin to religious ecstasy in these unholy displays, fellow congregants at the altar of rock ‘n’ roll. Those performances grew in stature and with that the shows were increasingly covered by the press in part because of the name recognition this hit guaranteed and they in turn reported in sensationalistic headlines the pandemonium McNeely was creating in audiences. The music, the wild performances, the crazed reactions of the fans and the stunned reaction to it all by the media fed off one another and firmly established rock’s notoriety in the process. It’s not for nothing the banner for Spontaneous Lunacy has Big Jay McNeely eliciting that response from a crowd in 1951. Rock music was always only partly about the music, the rest was always the cultural changes it foretold of, inspired and ultimately reflected. In 1949 nobody embodied the potential to change the musical landscape and all it enfolded more than Big Jay McNeely and this was the song which delivered that message to the masses. I wholeheartedly agree with both your “10” and general opinion of this recording. This is THE record of ’49. Big Jay’s performance here is nothing short of flawless. Additionally, Jimmy O’Brien’s ivory tickling, Ted Shirley’s bassline, and Bill Streetser’s drumming make up one heck of a rhythm section. That Big Jay hasn’t been inducted in the Rock & Roll Hall of Fame is a travesty. Amazingly, he’s still with us at age 90. This man is still honking audiences out of their seats to this day. So, if the Hall decided to induct him say this year, he could actually perform at the ceremony. At 90. As for the R&R HOF the less said about them the better for our sanity, but Big Jay is one of their more egregious omissions. His role in popularizing the theatrical showmanship aspect of live performances in rock is about as influential as you can get. He should be a national treasure and yet today he’s all but unknown and this despite being one of the last links to rock’s formative years who is still with us as you said. I don’t know if this website will be able to do anything to change that but he deserves all the attention he can get these days. Concerning Big Jay, there’s not a whole lot of in-depth/critical info on the net about him (in books, sure, but less so on the internet). Therefore, the more you put out there the better. Folks will likely run into your site looking for info on underrated artists like Mr. McNeely (that’s how I found this place). 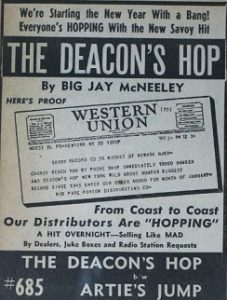 Leave a reply on "Big Jay McNeely: “The Deacon’s Hop”"